Photo: Valley Cardo near Dung Gate (south of excavation area). Todd Bolen  Bible Places Blog. Arqueólogos de la Dirección de Antigüedades de Israel han descubierto en la ciudad vieja de Jerusalén el barranco que, suponen, contuvo durante un mes la conquista del barrio judío después de la destrucción del Segundo Templo en el año 70 d.C.
'Este pudo haber sido un obstáculo natural, por la topografía, para la legión romana', que invadió Jerusalén en aquel año, 'y ha sido el descubrimiento más impresionante' en zona de Templo, indicó la directora de las excavaciones, Shlomit Wexler-Bedolaj, al diario 'Jerusalem Post'. Otro descubrimiento se produjo en el lecho del elevado barranco, donde encontraron un nuevo tramo de la vía del Cardo con su ancho original, de once metros, que construyeron los romanos y que cruzaba Jerusalén de norte a sur. Parte del pavimento del Cardo, bordeado por columnas, fue hallado durante excavaciones anteriores y rehabilitado para servir como atracción turística por las autoridades israelíes, una suerte de 'avenida' flanqueada por locales comerciales como en la Edad Media. El comienzo del Cardo estaba en el que desde hace más de 500 años es el portal de Damasco, en la muralla que rodea la ciudad vieja y que edificó Suleimán el Magnífico tras la conquista musulmana de Jerusalén en el siglo VII d.C.
'Estas excavaciones nos permiten estudiar un importante capítulo en la historia milenaria de Jerusalén, paso a paso y período por período', dijo la directora. 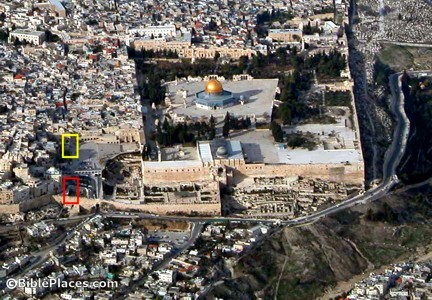 Photo: (Yellow box = present excavations; red box = Byzantine Valley Cardo previously revealed). Todd Bolen  Bible Places Blog. Antiquities Authority archeologists describe the important discoveries uncovered opposite the Temple Mount at a press conference on Sunday. Photo: Israel Antiquities Authority. An immense bedrock cliff uncovered opposite Jerusalem's Temple Mount may help explain why it took the Romans so long to capture what is now known as the Jewish Quarter almost two millenia ago, an Israeli archeologist said Sunday. 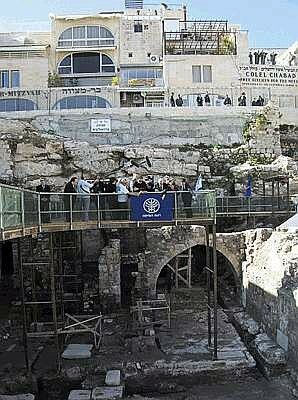 The cliff, uncovered during a year-long excavation at the western edge of the Western Wall Plaza, was one of several important finds that include the remains of a colonnaded street called the Eastern Cardo, dating from the Roman-Byzantine period; a section of the Lower Aqueduct that conveyed water from Solomon's Pools to the Temple Mount; and a damaged rock-hewn and plastered Jewish mikve (ritual bath) that dates back to the Second Temple period, the Israel Antiquities Authority announced at a press conference. Photo: In the close-up below, it looks like large hewn slabs (paving stones?) have been removed in order to excavate beneath them. Todd Bolen  Bible Places Blog. 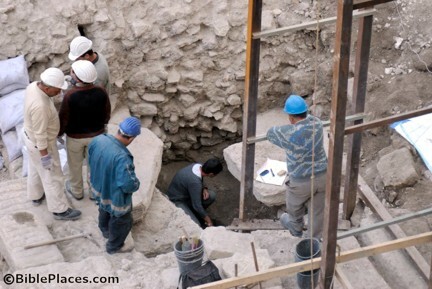 The dig, which was conducted in an area that had not been excavated before due to plans for construction, also served to clarify the height of an immense bedrock cliff that separated the Upper City from the Temple Mount area. 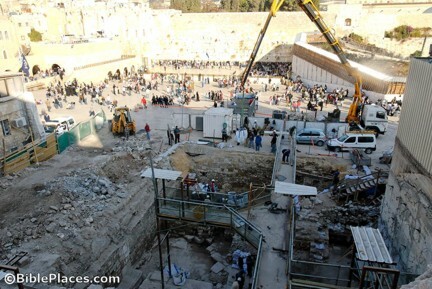 It in itself is "the most impressive" find, said Shlomit Wexler-Bedolah, the excavation director. Wexler-Bedolah said the cliff's topography could help explain the slow Roman conquest, noting that it took the Roman army an entire month from the time they destroyed the Temple Mount on the ninth day of the Hebrew month of Av until they captured the ground of today's Jewish Quarter on the 10th day of the following month. "This could have been a natural obstacle for the Roman army," she said. Jerusalem regional archeologist Jon Seligman focused on the significance of the road that was uncovered at the foot of the cliff - an elaborate colonnaded street known as the Eastern Cardo. 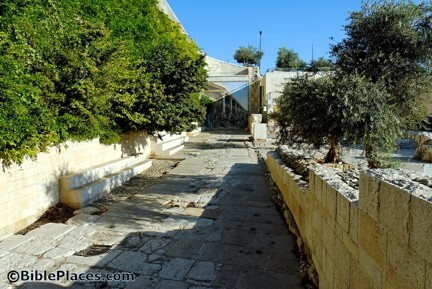 The street, which began at the Damascus Gate, ran the length of the Tyropoeon Valley channel. Sections of the street had previously been uncovered in the northern part of the Old City, on Rehov Ha-Gai and west of the Dung Gate. Wexler-Bedolah said the current excavation exposed for the first time the full 11-meter width of the original road, which had been paved in the Roman manner with large flagstones set in place diagonally, probably to prevent wagons from slipping. A drainage system had been installed below the flagstones, she said. A complex of shops and buildings constructed on the spot in the Middle Ages continued to exist through the Ottoman period and constituted part of the Mughrabi Quarter that stood at the site until 1967. Photo: My guess is that those large paving slabs are part of the Byzantine "Valley Cardo," which has been discovered to the south. Todd Bolen  Bible Places Blog. "This excavation allows us to learn an important chapter in thousands of years of history, stage after stage and period after period in the existence of this city," Wexler-Bedolah said. The newly found remnants of the capital's past will be preserved underneath the new Western Wall Heritage Center, which is slated to be built at the site and whose planning sparked the "rescue (or salvage) dig." The center, whose construction is expected to take several years and is being underwritten by US media mogul Mort Zuckerman, will include an educational center, a video conference room, a VIP lounge and a police station, said Rabbi of the Western Wall Shmuel Rabinovitch. There have never been any archeological excavations on the Temple Mount itself due to the site's holy status for both Jews and Muslims.